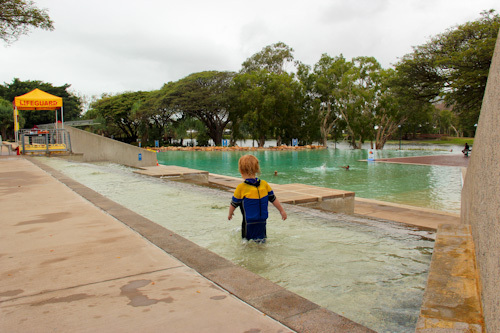 We were looking for quite a different playground in Townsville when we stumbled upon Riverway. Well, stumbled as in: drove into the carpark where a friendly local waved us down to say hello and, why yes, there’s a fabulous playground down that walking track. 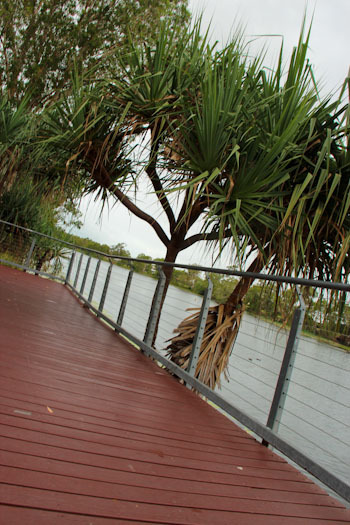 It was a fine introduction to Riverway, which is an arts and leisure precinct situated alongside the Ross River. First, we stop to examine the fallen red blossoms from this tree. I haven't been able to identify it satisfactorily, so if someone can tell me it's name, I'd love to know! 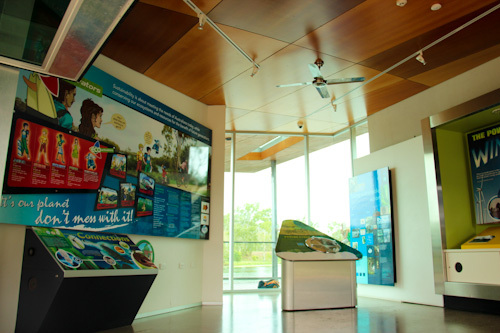 An eco-active centre is designed to provide educational encouragement to visitors on energy use, but its interactive exhibits are disabled and almost pointless now. We took a quick surveying walk to see what was on offer before returning to our bus to change into our swimmers. 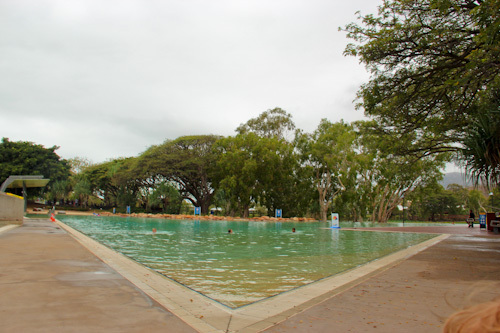 The girls all wanted to swim, even though the weather was overcast and showery. 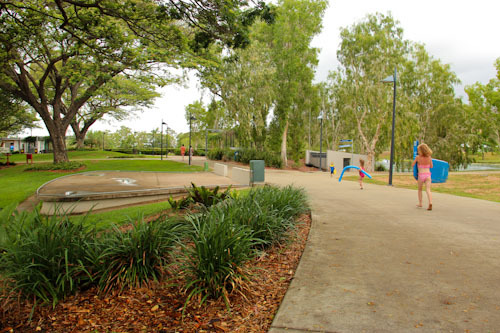 We follow the wide paths to the play areas of Riverway. Walkways parallel the Ross River, giving a great view of the ski-boats whizzing past and providing a platform for keen fishermen. The lower swimming lagoon features an invisible edge, so from certain angles the water looks like it merges with the river. 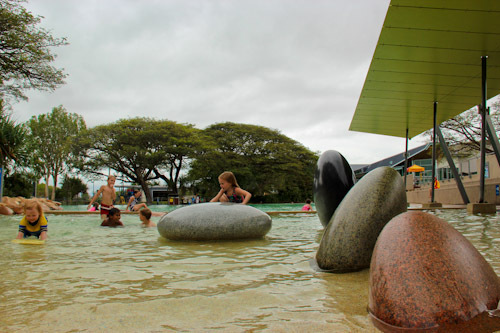 The toddlers section is dominated by smooth granite ovals, part of a pop art installation called "Smarteez" by Hew Chee Fong and Loretta Noonan. A series of cascading pools connect the lower lagoon with another upper swimming pool. The upper pool is deeper with lanes marked for swimming laps. Although it's a Saturday, for a time we're the only ones in the pool. Perhaps the cloudy day has chased away the warm-blooded locals. 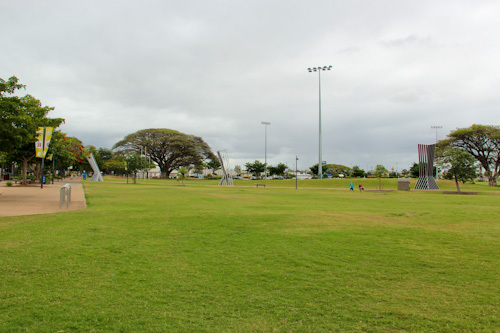 Large lawns separate the swimming precinct from sporting facilities. 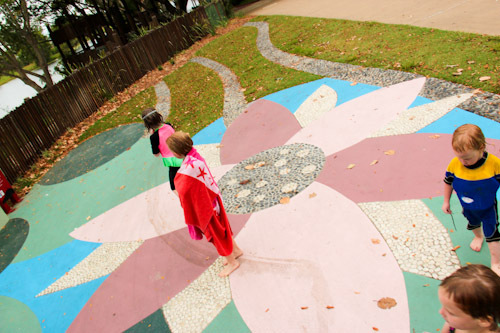 The entrance to the all-abilities playground is brightened up by a large mosaic on the ground. I hadn't noticed it until the girls remarked upon its elements. 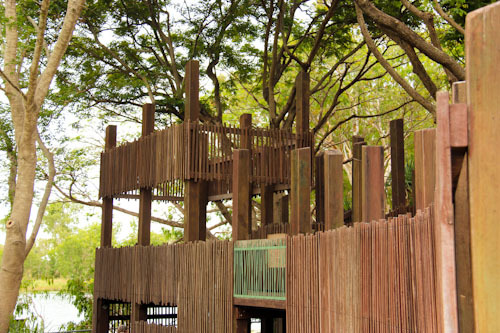 A large timber fort provides views over the river and a great area for the kids to play. Brioni practices her balancing act on the horizontal poles. 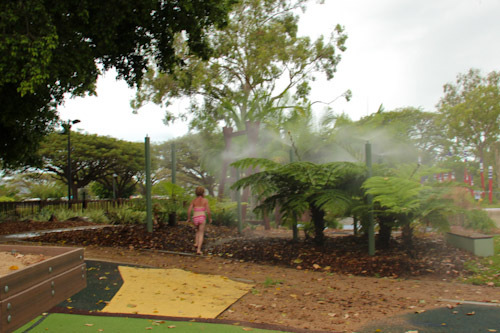 The play area is divided into areas to stimulate all the senses. 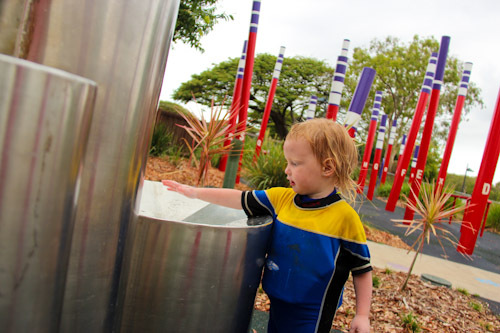 Percussive structures invite hands to pat them. The girls loved playing at Riverway. 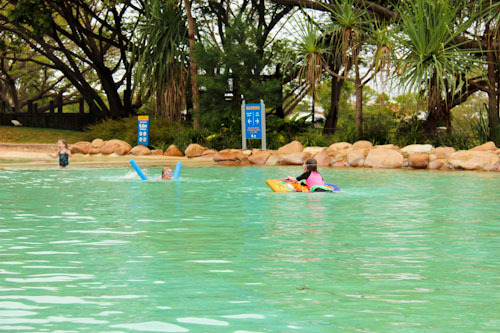 Although it’s hard not to compare the pool and playground areas to those at South Bank, we appreciate discovering that these fantastic free water parks exist in many different locations around the country! The fallen blossoms look like Crepe Myrtle blossoms. 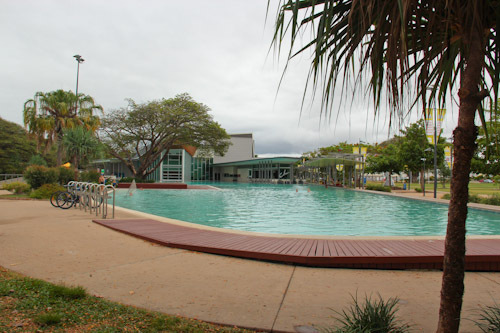 When you come back through,there is also Crystal creek,which is absolutely gorgeous, and the rockpool/ waterpark on the main beach in Townsville. 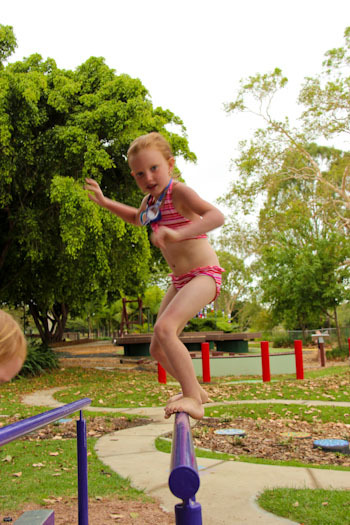 If you haven’t already linked up with the Atherton homeschool group,there is an amazing homeschool/ unschool group in the Atherton tablelands,near Cairns,and my kids favourite place to go in Cairns is the Big 4 coconuts caravan resort. You can just go to Coconuts for the day without staying there,and thd kids love the giant jumping pillows,pools,water park,you name ot! Wow! What an amazing place to play! I don’t believe we have anything like that for free over here in NZ. It looks fantastic! There is nothing much in my locality that is free like that and we have HOT summers. For a free play in a small ‘water park’ we’d have to drive for 2 and a half hours. I think it’s great that these sort of things are provided. As a side note we watched the eclipse live on the internet this morning and it was thanks to your awesome blog that we found out about it. Thanks! We hope you guys enjoyed it as much as we did!